Social Media & New Sign Ups – JND is on Facebook and Twitter, with social media editor Dr. Grace McMacken at the helm. Be sure to follow us and be part of the conversation! If you are not already signed up to the JND newsletter, you can do so via this link tiny.cc/JNDsignup. We send mailings with details of for new JND issues, plus other related news. You can read the latest newsletter here. Partnership with TNMD – As of December 2017, a new partnership was announced between JND and TREAT-NMD (treat-nmd.eu), a network for the neuromuscular field. The partnership ensures both teams will work together to give a platform to the latest developments in neuromuscular diseases research. TREAT-NMD members are eligible to receive a 20% discount to an individual yearly subscription to JND, as well as a 10% discount on the optional Open Access fee for accepted papers. For more details, contact the editorial office (email: jnd@iospress.com). JND accepted for inclusion in PubMed (MEDLINE) – As of November 2016, the Journal of Neuromuscular Diseases was selected for inclusion in MEDLINE, the largest component of PubMed. MEDLINE is searchable for free using PubMed at pubmed.gov. Citations and abstracts for articles published in the journal going back to Volume 1/Number 1 are available in the PubMed database. Why publish in JND? – Low Open Access fee: JND offers an optional Open Access fee of $1450/EUR1250. JND is fully compliant to funding agencies’ mandates and Open Access articles are automatically uploaded to PubMed Central. JND offers rigorous peer review and has a rapid handling turn-around time of 35 days from receipt to to first decision. The Editors do their best to get you the result to your article’s review as soon as possible. If your article is accepted it will be in our online contents and visible in PubMed within 3 weeks, and published in an issue at a minimum of one month and a maximum of four months. 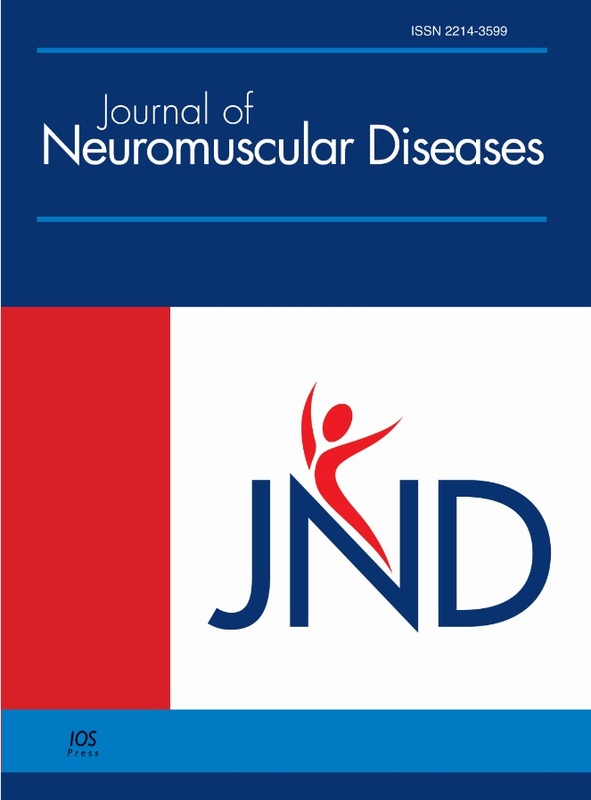 The Journal of Neuromuscular Diseases aims to facilitate progress in understanding the molecular genetics/correlates, pathogenesis, pharmacology, diagnosis and treatment of acquired and genetic neuromuscular diseases (including muscular dystrophy, myasthenia gravis, spinal muscular atrophy, neuropathies, myopathies, myotonias and myositis). The journal publishes research reports, reviews, short communications, letters-to-the-editor, and will consider research that has negative findings. The journal is dedicated to providing an open forum for original research in basic science, translational and clinical research that will improve our fundamental understanding and lead to effective treatments of neuromuscular diseases. Thomas Braun, MD, Dr. rer. nat. Procedures involving experiments on human subjects should be in accord with the ethical standards of the Committee on Human Experimentation of the institution in which the experiments were done or in accord with the Helsinki Declaration of 1975. The author must state compliance in the cover letter and in the Methods section of the article. Clinical case reports will be considered for publication, but they should feature some novelty, such as improving our understanding of a pathomechanism. Authors can submit comments of 1000 words or less concerning prior articles published in JND to the Editors-in-Chief through the Editorial Office. - If there are Figures with recognizable patients then the patient permission for use of the Figure should be specified in the Figure legend. Please click here to pay the Open Access fee. Permissions for use of materials published in JND Reports (figures, tables, thesis publication) can be requested at publisher@iospress.nl.